A switch to a tabloid printing format in a national newspaper contract has led to Johnston Press making a £5.5m impairment charge relating to its Dinnington print site in Rotherham. Headquartered in Edinburgh, Johnston Press is one of the largest local and regional multimedia organisations in the UK and operates a £60m printing facility on the site of the former Dinnington Colliery. The Daily Express, Daily Star, Daily Star Sunday and Sunday Express are currently printed at Dinnington. Other major customers including News UK, Guardian Media Group, Trinity Regional titles (formerly Local World), Tindle Newspapers, as well as many niche publications. The Guardian Media Group switched its Guardian and Observer titles from the Berliner format to the Tabloid format in January 2018. It previously announced that printing would be outsourced to Trinity Mirror. Johnston Press revealed the reduced value relating to its Dinnington press in its financial results for the year ending December 2017. The impairment charge means that the book value of the asset exceeds the profit and cash flow to be gained from the asset. For the year ending December 2017, the company posted a 9.5% decline in overall revenues to £201.6m. A loss before tax of £95.0m was reported, which compared to a loss of £300.7m in the previous year. The reduction by 68.4% includes a non-cash impairment of £64.4m, compared to £344.3m in 2016. As the publisher of titles including the Yorkshire Post and Sheffield Star, the company said the trading environment remained "challenging, notwithstanding early signs of some improvement in the national print advertising market." Johnston Press reported that contract printing revenue was £13.3m, up 4.2% on the previous year. During the period, a print contract for the Trinity Regional titles that currently print at Johnston Press print sites at Portsmouth and Dinnington was extended for a further three years to 2020. The report stated that it had an "increasing market share, with strong record of client retention and competitive wins for Sheffield and Portsmouth print plants." It added that it was "an encouraging performance, particularly in light of the contraction in the overall market, and achieved through a combination of maintaining existing contracts and winning new contracts to print." The report concludes: "The market for contract printing remains challenging as volume continues to come out of the market as circulation volumes across the sector continue to decline, which will be further accelerated by a further hike in newsprint price rises from January 2018. 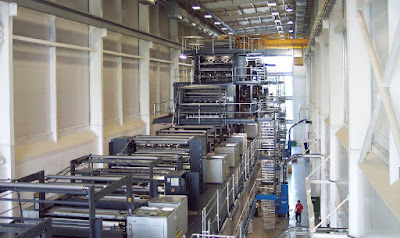 Johnston Press, is one of three major printers in the United Kingdom, (alongside Trinity Mirror and News UK). In 2017 capacity in the market has shrunk, and some smaller printers have ceased production, while we have been able to flex our capacity to take on new business."